Getting Published and Getting Paid! Don't make the same mistakes 99% of all first-time authors make. and publishers open the door! Imagine yourself on the balcony of your vacation home overlooking a serene ocean view. The warm tropical breeze floats around you as you type away on your laptop…writing your next bestseller. Every once and a while you look up and consider taking a break for a relaxing swim in the ocean. Just as you reach for the cool drink sitting next to you, your cell phone rings. “Not now,” you say to no one in particular. But you look at the caller ID. Hmmm, it’s your literary agent. She knows you’re working and wouldn’t call unless it’s important. So you decide to pick up. And it’s a good thing you did. She’s emailing over the details of a deal to make your last novel into a movie! Whew…you’ve come a long way…from an unpublished, unknown writer to the next big thing on the literary scene. Once you have the first two elements, that’s when I come in. I know, I know…the image of the struggling writer is so ingrained in your head. How many times have you read that being rejected is a part of being a writer? You must pay your dues before you achieve success. But how many dues are you supposed to pay? How many years are you expected to struggle? Why do some writers hit it big right away while others have a stack of rejection letters a mile-high? Some may say it’s the quality of the manuscript. You may think only authors who present the most interesting and well-written manuscripts get the honor of Literary Agent representation and seeing their manuscript published. Only the best authors get public recognition and vindication that they are real writers. If your manuscript fails to attract a Publisher, does that mean it’s not any good? If you’ve had multiple rejections and you’re losing hope, does that mean you should give up your dream of being a writer? What I am leading to is this… The writers who attract Literary Agents and Get Published are the ones who know how to sell their manuscript. You may have the Next Big Thing sitting on your shelf but unless you know the secret formula to getting a Literary Agent, it will probably stay there. And yes, there are tons of writers’ resources that supposedly guide you through the process. But I have never seen a comprehensive guide that gives you everything you need to know. My name is Donna Sozio and I was in your shoes…for so many years. I spent a year and a half writing my book based on an idea I had in the middle of the night. I knew I had something great. If only I could convince a Literary Agent to read the manuscript, I knew I would have an instant bestseller! So I started to read everything I could on how to get published…and believe me there is a lot of information out there. But nothing seemed to work. I spent thousands of dollars on writers’ extension classes, writers’ conferences, private coaching, memberships, mentors, publicists, panels and interviews. And believe me, not one person ever told me what you will find out in my E-Course. After all of my years of research, I never found one source that had all of the information I needed to know. Trust me, no one will tell you the Secret Rules of Publishing. They’re like the secret “powder stashes” at a popular ski resort. The locals do everything to keep them a secret. But get ready for literary success because I’m about to change all that. After my seven years of research, I finally got it. And once I cracked the code, my results skyrocketed! Within 3 weeks of submitting, I received multiple offers from reputable literary agencies! In another 3 weeks, my manuscript sold to a major book publisher! A producer then optioned the movie rights! Again, I received multiple offers of literary representation. I sold the TV/Film rights of my second book to a 5-time Emmy Award Winning Producer, before I finished writing it! But Donna, You Make it Sound So Simple! Well yes…it is simple. That’s why I wrote The Secret Rules of Publishing: What Every First-Time Author Needs to Know. Whether you’ve written a romance novel, an action-packed novel, a non-fiction book, a children’s book or maybe you’re still working on your manuscript, it doesn’t matter. If you follow my simple system, you’ll dramatically boost your chances of getting a Literary Agent and getting your manuscript Published. My system includes everything you need to know about how to get a Literary Agent and get your Book Published. I tell you what no one else will. You’ll tap into my hard-won wisdom so you can be the success you were meant to be. Following my system will get you noticed in the literary world. I will guide you every step of the way and help you avoid the pitfalls most first-time authors make. The 4 Elements of a Slam-Dunk-Sign-Me-Now Query Letter that will make any agent forget that you are a first-time author. The Eleven Most Common Mistakes First-Time Authors Make Without Even Realizing it While Following the “Typical” Submission Advice. The Little but Lethal signs that tip off Publishers you’re a first-time author. How to write Successful Query Letters Literary Agents prefer most. 7 Unexpected Ways to Woo, Wow, and Entertain(instead of explain) in your Query Letter. 8 Surefire Techniques on how to Create an Instant Bestseller. The Success Secrets every Mega-Brand Author uses to Make Literary Agents and Publishers Hear Dollar Signs. How to Tap into the Commercial Potential of your Book to get literary agents on the phone and offer you representation. How to beat the Secret System publishers use to Instantly Screen Out First-time Authors before even reading your manuscript. 5 Eye-Opening tactics that help you Redefine the Submission Process to Win the Publishing Game. in the Digital Media Age! You'll get Entirely New Information for writers on how to maximize social networking, get free publicity online including massive exposure with major bloggers, gain a lucrative following with online forums and Twitter and more! Quick Fix Solutions to correct even the worst submission mistakes. Read the Actual Query Letter I sent that landed me Multiple Offers from Literary Agents within 3 weeks. A List of Writers’ Legal Resources every author should have but most first-time authors don’t know about. A Simple Strategy how writers can follow Submission Guidelines even if they are different for every literary agent. Learn how to Manage Your Responses from Literary Agents & Publishers (yes, I said responses!). You’ll be so excited that you’ll need this system to guide you through. What Literary Agents Secretly Love to read in your query letter and book proposal. The Huge Advantage of Submitting by Email that most first-time authors almost always overlook. How to build a Master Agent List to double your chances of selling your book. 6 Simple Strategies that Highlight the Bestselling Aspects of Your Book to convince publishers you have an instant bestseller. How to Turn Your Title into Brilliant Selling Piecefor your book. 7 Ways to Instantly make Literary Agents think you will be a Successful Author. A one-stop, user-friendly resource where to find Literary Agents Actively Building a Client List. My step-by-step Submission Management System...it will bring order to the chaos of submitting to over a hundred Literary Agents in a week. The Most Critical Element you must identify in your marketing plan to convince any publisher that you are a Book Marketing Master. How to Get an Agent’s Attention The Right Way by passing their secret “first-time author” Firewall Test. How to Spot “Bad” Agents and Stay Safe from literary scam artists trying to take your money. Writing Advice by Famous Authors. The True Meaning of a Successful Writer. A Query Letter Checklist will ensure you don’t miss a thing. How to make a Submission Package for Literary AgentsIrresistible. The Truth how Literary Agents help Get First-Time Authors Published. 7 Secrets to Writing a Non-Fiction Book Proposal that sells (Most first-time authors would never think of these). And much, much more to keep you on track, get published, and help make your dream of becoming a successful author come true! Yes! I want to get published! The Secret Rules of Publishing! If you are ready to be a successful writer, this eCourse shows you exactly what to do and how to do it. Just think about what life would be like if you could make a good living by just writing. What would that mean to your family? Would you be able to spend more quality time with them? Give them everything they want? And most importantly, what would it mean to you? How relaxed would you be, knowing that your day job is your dream job? Maybe you would enjoy the recognition and prestige of being a writer. Wouldn’t it feel great to be able to say you’re a writer when someone asks what you do? And perhaps most importantly…you would be able to share your experiences and opinions with the world through your writing! If you are serious about becoming an author and creating an instant bestseller, then you need this eCourse. What took me 7 years of struggle to learn, you can learn just as quickly as you can read this book. It has the right information to help you achieve your dreams. I just wrote a collection of short stories. Everyone told me how good they are and how I should find a literary agent but I didn’t know even the first step to take. This book made it clear. Now, I know what to do. I know how to maintain the integrity of my book while I “sell” it to agents. Before reading your eCourse, I had no idea just how much I was getting in my own way while trying to get published. I would always procrastinate and then get down on myself for not following through. Reading your chapter on the “Submission Olympics” got me going. I’ve now submitted to over 45 agents and as your book taught me… I’m expecting the best! Your book pulled me out of my rut and put me into action. I’ve never felt better about being a writer. I had to write to thank you! I’m finally doing what I’ve only been talking about for years! I’ve actually rewritten the query letter for my novel. It’s light years more marketable than what I previously had. As I read your book the light bulb went off inside my head. Although I work in marketing I never thought about actually applying what I know to sell my own book. Sometimes it takes someone else to point out the million-dollar idea staring you in the face. What’s best is that you showed me how to use the sincerity of my book’s own message to get an agent’s attention. 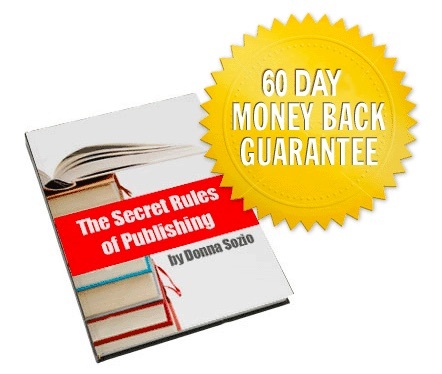 Donna Sozio is not only a truly gifted writer she is also a wonderful and inspiring coach. Donna has a rare gift of insight to help writers delve into the heart of their work to unleash it's best potential. Donna can take you from A-Z with regard to book proposals, synopsis, queries and marketing. OK…So How Much Does it Cost? I wrote this eCourse in an electronic format so you can instantly access this information for a low, affordable price. Hands down, this is the best investment you will ever make in your writing career. You’ll pay only $47 for this book that can propel you from frustrated writer to published author in less than 3 weeks! You’ve waited long enough. It’s time to take your writing career seriously and turn your talent into dollars. What If I Don’t Love the Book? I am so confident that you will be delighted with this book that I am offering a 60-Day Money-Back Guarantee! That’s right, if you are not completely satisfied with this book for any reason, I will be happy to return 100% of your money. All you have to do is let me know within 60 days. I know what if feels like to be a first-time author. And I know how difficult it is to get the right information you need to sell your book. That’s why I wrote this E-Course so you can begin your career as a successful author. You only need to say YES! and absolutely nothing to lose! P.S. : To claim your FREE bonus teleconferences, simply click on a link above and place your order. And remember, you have nothing to lose with a 60-Day Money-Back Guarantee protecting you. P.P.S. :For every System purchased, I personally donate 10% to The Gwendolyn Strong Foundation (TheGSF.org) to help Change The Future of SMA. (C) 2007 All Rights Reserved. By entering and/or purchasing products you agree to all the TERMS AND CONDITIONS.